Elsie Carlisle (January 28, 1896-September 5, 1977), born in Manchester, England, was a prominent vocalist for the great British dance bands of the 1920s-1940s, as well as a prolific solo artist. She had her start in musical theater and was so highly thought of that Cole Porter personally requested her to introduce the jazz standard “What Is This Thing Called Love?” in a 1929 London stage production.1 She was on television as early as 1930 and appeared in films. She was primarily famous at the time, however, for her broadcasting, and by the mid-1930s she had become the most popular female singer on the airwaves, earning the epithets “The Idol of the Radio” and “Radio Sweetheart No. 1” (amongst many other amusing appellations). Her 340 recordings, in which she either provided “vocal refrain” for some eminent band or on which her own name (or occasionally a pseudonym) is given first place, have ensured that future generations can enjoy the output of this paragon of twentieth century popular music. The band she is most often associated with is the elite Ambrose Orchestra, with whom she recorded the still-popular songs “The Clouds Will Soon Roll By,” “Pu-Leeze! Mister Hemingway!” and “You’ve Got Me Crying Again,” but some of her best collaborations were with other bands, such as Arthur Lally’s Rhythm Maniacs, Ray Starita’s Ambassadors’ Band, and Jack Harris and His Orchestra. In the 1930s, Elsie frequently sang duets and toured with Sam Browne, both under the direction of Ambrose and separately. 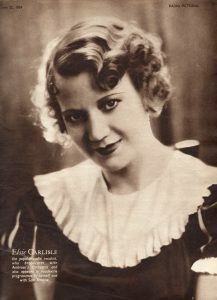 Elsie Carlisle’s style (particularly in her early career) has often been compared to that of American singers Ruth Etting and Annette Hanshaw. The comparison is not entirely unreasonable, insofar as Elsie started out singing a similar selection of popular songs and occasionally adopted personae similar to those of the other singers to fit the themes of the lyrics, but Elsie had a unique approach in her delivery that might almost be called dramatic. The selective quavering of her voice in her early torch songs, which is touching and provokes an emotional response, is more the mark of a consummate musical actress than that of a jazz crooner. The “celebrated comédienne,” as she is described on early record labels, was also known for the frequent levity of her singing; she even made bawdy recordings not fit for radio broadcast, such as “My Man o’ War,” “My Handy Man,” and, of course, “Pu-Leeze! Mister Hemingway!” These songs are full of sexually suggestive expressions, double-entendres, and metaphors. Elsie stopped recording in 1942, though she was on stage and toured throughout the War. After that time she withdrew from public life and became a successful businesswoman, with a ballroom in London and an inn in Berkshire. She lived in a house in the posh Mayfair district of London for several decades, and died on September 5, 1977, in a hospital in Chelsea. British dance band music, which as a genre dwindled after the Second World War, has seen a revival in public interest in recent years, due in no small part to its being featured in the popular 1978 Dennis Potter television series Pennies From Heaven. Elsie’s voice is showcased in the very first scene, in which Bob Hoskins lip-syncs as Ambrose’s 1932 recording of “The Clouds Will Soon Roll By” is played. Elsie resurfaces again in a later episode when Cheryl Campbell mimes the 1933 Ambrose recording of “You’ve Got Me Crying Again” while putatively reading a psalm to schoolchildren. Elsie Carlisle occasionally recorded under the pseudonyms Maisie Ramsey, Amy Brunton, Sheila Kay, Gracie Collins, and Lallie Lack. I am really sad that I never got to meet her.love her singing style original and copied by many. I am told my father was a cousin ! I didn’t know until too late! I’m always so pleased to hear from a family member! I’ve got a great-niece and her son reading my Facebook page. I’m doing genealogical research on Elsie Carlisle in the hopes of filling in the huge gaps in the narrative of her life. It would be interesting to figure out exactly how your father was related. Raw talent does often seem to run in families, doesn’t it? But I’m sure your granddaughter has really applied herself. Best wishes to both of you! I just found out she was my great-aunt on my father’s side. Hi Michel, I’m interested in Elsie Carlisle too. I’m starting out in a freelance writing career and would like to do an article about her. If you have any information that may be of use to me please contact me or reply to this message and I’ll contact you. I’m interested in just about anything about her — maybe some inside information about her up bringing, family life and music career. You are greatly blessed to have such a beautiful and talented ancestor. Hello, I’m looking for some information about Elsie as well. I have been researching genealogy for my daughters. Their Grandmother was originally from Sheffield, England and her parents immigrated to Canada. She in turn immigrated here to the US. Would anyone know where I might look to find family group records regarding the Carlisle family from Manchester? Thank you in advance for your help. Have a wonderful day! Like many people, I have found http://www.ancestry.com (which appears now to have fully merged with http://www.ancestry.co.uk) to be the best starting point for any genealogical query. In many cases they have scans of original documents that make the expensive ordering of paper copies unnecessary. Occasionally it is necessary to contact British government offices directly, but for most normal documents Ancestry is the best broker. Carlisle is a fairly common name, but if you plug in a few extra data (names of parents, siblings, probable birth years, and the like), you can discover a good deal. Moving on from there, Manchester has some very good city archives, and some of their material is online. I wish you the best of luck! Thank you very much Alex. I will check with those resources. I’ve been told that Elsie Carlisle was my great-aunt. You might try Trowbridge, UK. I’m told that Elsie Carlisle was my great-aunt. Her sister, my grandmother, lived most of her life in Trowbridge. My Father has been trying for some years to find information about Elsie Carlise as he was told there is a family connection but could not get any information about her. I wrote to Radio Mersyside some years ago they had no information about her but there was a Wikipedia article that mentioned she also had a brother named Richard who was born in Preston 1890 and played for Preston North End football team. I have just found this site yesterday after having another search but searching for more information. Beautiful voice, beautiful woman; would’ve made a pass at her. I’ve got an Ambrose album that I listen to just to hear her sing. I love watching her in the video on YouTube doing “My Canary Got Circles Under his Eyes”. How surprised I was to learn that Elsie Carlisle died in `77, the year I was married! I used to listen to the 4 in 1 record with her singing “Stop The Sun – Stop The Moon” beginning when I was a little boy in the fifties. One more thing: that recording is particularly good – note how clearly the cymbal sounds – an early condenser microphone, I would imagine.